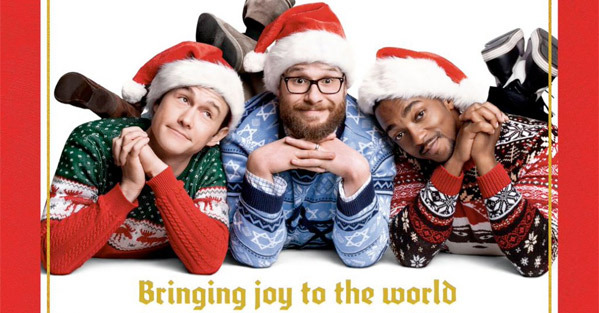 One of this year's holiday comedies is The Night Before, about three friends, three ride-or-die homies, who go on one final Christmas eve adventure in New York. In truth it's actually a much sweeter story about friendship, and how important is to hold onto the friends that mean something to us. The Night Before is directed by Jonathan Levine, a filmmaker I first met in 2008 at the Sundance Film Festival because I went crazy for his film The Wackness. Years later he has directed two other films - 50/50, Warm Bodies - and now his latest is this one, The Night Before, once known as X-Mas or the Christmas Eve Project. It's a very fun movie and I had a great time talking with Jonathan about the challenge of making audiences laugh. My first question, and don't take this the wrong way, but I like asking filmmakers - are you where you want to be right now in your career? Levine: Yeah. I think so. I wouldn't take it the wrong way - that's a cool question. Yes. I actually think that I'm very, very lucky, and I think that I'm really, really happy that I have such great creative collaborators. To be a director you have to think you're the best. Ever since I went to film school, I imagined that you have to think deep down that you want to be Martin Scorsese or you want to be P.T. Anderson. Like, am I as good as those guys? Absolutely not. I feel like I keep learning and I feel like I keep getting better. Do I wish I was Martin Scorsese? Yeah. But am I really proud of the movies I've made and really happy that I get to keep making them? Yes. You know, the only level on which I'd be disappointed in my life or my career is based on the unreasonably ridiculous expectations of my own ego that are completely inappropriate to have anyway. So yes, I'm thrilled with my career. I'm thrilled with this movie and that I get to keep making them. What I enjoy about your films is that they're actually about great characters, and the relationships people have. I go in thinking one thing and expecting something big or crazy, but discover that it's actually this smart character piece about connections and real people. Levine: Thank you. That's very, very kind of you. For me that's the number one thing of anything, is that it all comes from a real place. Obviously this is a more broad, commercial thing than I've done before. But I think that for me it all has to be of a certain quality level and you have to reflect your life. For me this movie is about old friends and what it means to kind of evolve with your friends and how, if you're not careful, you won't have your old friends anymore because life gets in the way. And I think the importance of friendship, too, is what is so meaningful about this movie to me, because I value my friends more than anything in the world. I have a two-month old baby and I just got married a year ago. They would have to take priority over my friends, but without my friends I don't know that I would make it through the day. There are things that I can tell my friends that I just can't tell my family, just as far as how I'm feeling about things. My friends know me the best in a certain way. I just think old friends are really, really important. And I think there's that in this movie and there's, like, what's the person you want to be and who do you want to become? How do your friends help you get there? And hopefully it's a comedic effect. But yes, I really, really appreciate that compliment. It's always gotta start with real stuff. Levine: [Laughs] I don't know, ha. The movie itself was an idea I brought to Seth and Evan. I used to go out on Christmas with my friends in New York all the time. I found it to be a very interesting night. Just a weird – the city is so sleepy, but yet, it's New York, so you can always find a weird group of people doing something. It was also a really emotionally charged time. So, for me… basically, I brought that idea to them and then we all kind of worked on it together. So I was always part of the evolution of it. We really kept working, kept working, kept working, and everyone's ideas kinda got into the finished product. For me, I knew that… I don't write well to set pieces and plot. And those guys helped me with that. It was definitely just a true collaboration, but there was always that… it always came from a place of character and heart. We knew this was an opportunity to do something was crowd pleasing and fun but also it had a lot of soul to it. Was Joseph Gordon-Levitt involved in the original plans…? Levine: Yeah. We always wanted Joe, so we asked him… Once we got the idea and once I started writing it, Joe was like the second most early involved. 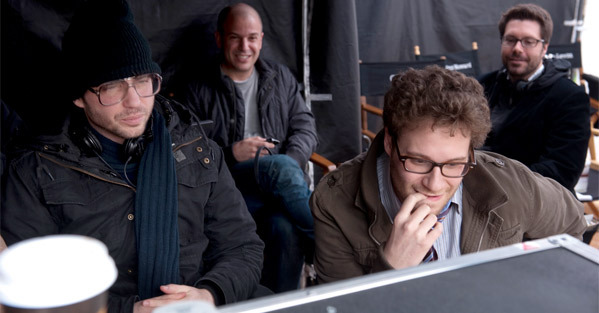 It was like me, Seth, and Evan [Goldberg], and then we went right to Joe. We were writing for Seth and Joe and then everyone else kinda came on. There's an importance to the dynamic of that group of dudes. And you can't get that wrong because then the whole movie doesn't work. Levine: Yeah. To me there's the person… In every group there's the person who is emotionally stunted, and that's [who] Joe [is playing], and also stunted career-wise. He doesn't have as much money as the other people and isn't happy with his own life. And then there's someone who is starting a family, and that's Seth. And then there's someone who has had a lot of career success and is trying to figure out how to be a real person. And that's Anthony. And so, I think in every group of friends there are some people like that and that informs the dynamics of stuff quite a bit. I like your casting because it seems odd, but you always make them work in interesting ways. I want to ask about how much this is being sold as a Christmas movie, and how much did you have to push back against that? Levine: I'm the last person to help with how to sell a movie. But even in the development, were they not saying "you need to make sure that you have this [insert Christmas trope] in it?" Levine: No, it wasn't like that. I embrace that stuff. I love Christmas movies, so it all comes from love of some of the '80s movies specifically and Christmas movies in general. And so, I wanted to hit all those tropes as much as we could. I remember thinking… I knew I was going to do this next after Warm Bodies. I remember being on the set of Warm Bodies watching Nick [Hoult] grunt and groan and being like, "Oh, man. This could go really bad." Luckily, it turned out great. But I was really excited to do a movie that was not as tonally complicated, but just was meant to please people. And the holiday movies are just so much what that's all about. So all that stuff as far as balancing holiday versus character, I think all that stuff is something the movie is very interested in trying to do. As far as how they sell it, I think that if they sold it as a character movie, probably not a lot of people would go see it. So I think that you want people to know that it's a feel good crazy night adventure that's going to satisfy them on both the level of comedy and the level of a holiday movie. And I think when people think that and then they go and actually see there's some real heart and character to it, I think that they're pleased by the fact that it's a little bit more than what they thought it was. I agree. For me, it was, "Well, this isn't what I was expecting, but I'm pleasantly surprised by what it was instead." Is it still hard to make comedy work with mass audiences? Did you guys test screen this? Levine: We did test screen it, pretty rigorously. Are you a fan of that process? Did it help? Levine: For this movie - I think it was great. This movie always tested really, really well, so it was great. I think if it had not tested well, it's put you in a… I can say that on this movie because it tested well. If it doesn't test well, as a filmmaker you are just kind of fucked a little bit because people start to lose confidence in the product. But this kept testing well and it gave me more and more ammunition to do what I wanted. So, no. I really, really enjoyed the process of it. I think that, look, without testing the movie would've been two hours long. You use testing to get rid of the jokes that don't work. And I think audiences actually… I'm always so thrilled at how smart audiences are. I think that movies talk down to audiences so much, and I think that audiences are so much more intelligent than people give them credit for. So I loved showing the movie to people. It's always stressful, but we tested his movie probably five or six times and it was incredibly helpful. I think that it helps you learn pace. And I think that pace, especially in movies today, is something that people are forgetting to deal with. In terms of a complete product, or that audiences get bored after two hours? Levine: I just think a lot of movies are too long. I want to know how to make my movie as tight as possible. But I also think that the testing process works when you understand it really well. I didn't understand it early on in my career. [All the Boys Love] Mandy Lane totally tested horribly. Wackness we never tested. 50/50 just tested great and we finished it. But Warm Bodies testing was the first time I figured out how to make it work for me and how to learn from it. With this [movie], we learned a lot from it. There was probably a version of this movie that was 95 minutes that didn't have as much heart as it ended up having in the final product. And audiences were asking for that, which was great. They gave me permission to put a lot of stuff back. So yeah, I actually really, really enjoy the process. I think for this movie in particular it worked really well because this movie was meant to make audiences happy. I think for movies that are more challenging subject matter, yeah, maybe they shouldn't be tested. But hopefully you have producers and a studio that know what the movie is and know how to read the testing to use it to your advantage. But I can understand why a lot of filmmakers wouldn't like it. I hate going through it. It always stresses me out. But I understand how beneficial it is. Yeah, but in the end it's worth it? Levine: I think it's great. I think it's awesome. At this point in your career, what is the one greatest tool, or the one greatest asset, that is important to make great films? Levine: I think it's always really nice to have a good, strong support system around you. There are so many things that go into making a great movie. But any one person really can't make a great movie by themselves. You need people… I, in particular, need people to turn to after I've cut take four and be like, "I think I have it. Do you guys think I need anything else?" That's always so helpful. So having a support system is incredibly beneficial. The great thing about this movie is that it's about old friends and it was kind of a reunion for me with Joe, and Seth, and all those guys. It's like being back with old friends. And just having them around to sort of check your work at the end of a day is really, really important. Again, having the ego of the director, it's… not something you'd want to admit, but no person can make movies by themselves. So having the infrastructure of those guys is so, so important. I always hope to have that on every movie I do. Where do you want to go next? Will we see you at Sundance again sometime down the line? Or are you past that at this point? Levine: What I would like to do… I'm going to go hopefully make this movie with Amy Schumer, which is trying to be a big, broad comedy with a lot of heart. Again, very smart, very excellent script. I love making movies for mass audiences. But I do miss the Sundance vibe, too. So I would hope that I will return to that at some point. The thing I'm doing right now – I'm doing this pilot at Showtime, and it's much more traumatic than stuff I've done recently, even though it's about stand-up comedians. It feels really good to be back in that space. And so, I think definitely it won't be next, and it might not be the one right after that, but at some point in the next five years I'm hoping to do something a little more intimate and a little more personal. I just want you to keep making great films. As I said before, he way you surprise me with something different than what I was expecting, but it's still a great film in the end. Levine: That's cool. I'm glad that comes through in this one especially. It's great. 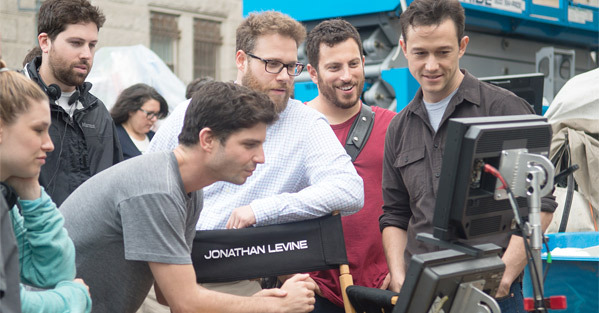 Thank you to Jonathan Levine for his time, and to Sony Pictures for arranging the interview. Jonathan Levine's The Night Before opens in US theaters everywhere starting November 20th, so head to your local movie theaters this holiday season and enjoy it. Read my 2011 interview with Jonathan here. I dig all of Levine's previous work and this one looks just a good as the rest. A good "one crazy night" film is almost always a good time.